Hall Render is proud to present a series of informative labor and employment law webinars intended specifically for health care employers. The health care industry is unlike any other and interacts with the law differently than other industries. 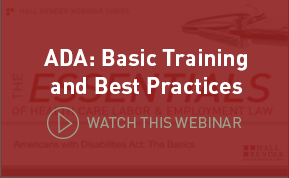 These webinars address some of the more critical areas of labor and employment law, focusing on both the distinctive needs of health care employers and the law’s unique treatment of the industry. 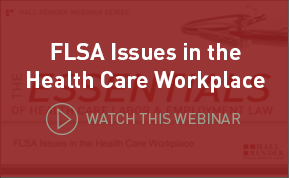 We hope that our clients and friends in health care human resources and those who serve as counsel to the health care industry find that these webinars are useful tools in understanding the myriad of issues unique to the health care industry. 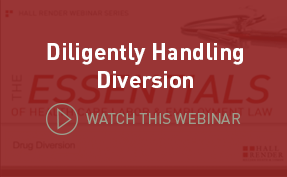 Our portfolio of webinars includes: Diligently Handling Diversion; ADA: Basic Training and Best Practices; Family and Medical Leave Act; NLRB and the Health Care Industry; FLSA Issues in the Health Care Workplace; and Conducting Effective Investigations in the Health Care Sector. According to the Drug Enforcement Administration, nearly seven million Americans are abusing prescription drugs, more than the combined number of those abusing cocaine, heroin, hallucinogens, ecstasy and inhalants. Included within this webinar are best practices for prevention and early intervention, the elements of a successful investigation, ways to mitigate risk and a checklist for addressing the resulting employment actions. Years after the Americans with Disabilities Act Amendments Act took effect, employers are still facing large settlements for failing to accommodate their disabled workers. Learn what your obligations are, best practices to reduce your organization’s risk and how to strategically document your interactive process to best defend enforcement action. Conducting effective investigations is more important than ever, especially in the health care workplace. 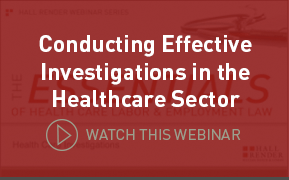 In this presentation, Larry Jensen will discuss the policies and tools all health care employers should have in place before the need for an investigation arises, as well as the uncommon events in the health care sector that trigger the need for an investigation. 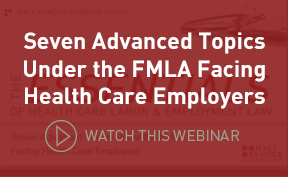 In this presentation, Hall Render attorneys focus on FMLA usage in the health care industry and provide a general overview of, among other things, how an employer should determine if an employee is eligible for FMLA-protected leave and what rights an eligible employee is entitled to. Join us as we offer insight into and analysis of wage and hour issues of unique interest to health care employers. Among the topics covered are the classification of employees, such as medical residents and interns. Health care employers today continue to face a number of evolving challenges, not the least of which are the constantly changing rules and guidance from the NLRB. 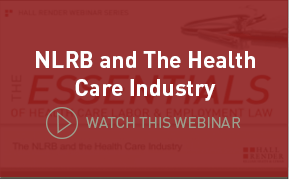 Join us as we review recent NLRB trends and developments affecting health care employers. 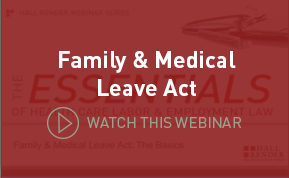 In this presentation, Hall Render attorneys offer a detailed analysis of several advanced topics under the Family and Medical Leave Act (“FMLA”) that are of unique interest to health care employers.